Provide comfort for the family of Diane Tomczak with a meaningful gesture of sympathy. Diane (Miano) Tomczak, 72, died peacefully at her home in Lakeville, CT on Saturday, December 29, 2018. She was born in New Britain, CT on December 12, 1946 daughter of the late Thomas and Ann (Battisone) Miano. Diane graduated from Pulaski High School in 1965 and Hartford Hospital School of Nursing, class of 1968. As she advanced her career as a nurse, she was also recognized as a gifted artist, singer and cook and with her former husband, the late Robert Tomczak, they opened a landscaping business after studying in England the art of English Garden Design. Diane is survived by her sister Donna M. Miano of New Britain and many cousins and friends. There will be no calling hours, but Donna will hold a Celebration of Life to be announced at a later date. Donations may be made in her memory to St. Jude’s Hospital, 262 Danny Thomas Place, Memphis, TN 38105 or the ASPCA, 424 E. 92nd St., New York, NY 10128-6804. The Paul A. Shaker Funeral Home, 764 Farmington Ave., New Britain, CT has charge of arrangements. To extend condolences to the Tomczak family or to share a memory of Diane, please visit SHAKERFUNERALHOME.COM. To send flowers in memory of Diane Tomczak (Miano), please visit our Heartfelt Sympathies Store. Provide comfort for the family of Diane Tomczak (Miano) by sending flowers. Diane and I were life-partners for over 20 years until she passed in our home last week. She had a big heart and always gave to many charities. We have lost someone who loved life and didn't want to go. Goodbye, Diane. Please accept our sympathy for Diane's passing. As I shared the news with school mates and friends, we immediately recalled the wonderful sound of her voice in the St. Francis children's choir when she sang solo Oh Holy Night. To this day whenever we hear the song we are reminded of her extraordinary talent at such a young age. Thank you Diane, you made a difference to all those who knew and loved you! 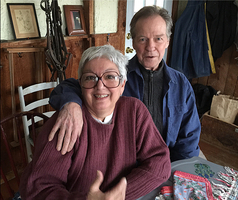 Diane and her life partner, Bill, taken two years ago.